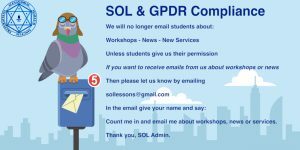 The EU will soon be introducing new information-handling requirements, and the SOL is working to ensure we are in compliance. We do not send our students many emails generally especially not marketing emails. We certainly do not work with any other schools, sell or share mailing lists. SOL exists to teach our students and to provide them with training and to support any student communities that arise, such as study groups or lodges. We do not keep any kind of marketing email database aimed at getting new members to join. We have never, and never will, focus on how many students we have as an indication of success with regards to teaching the mysteries. We aim to focus on the quality of the teaching we give to those who wish to work with us. We also turn many applications down if we feel we cannot serve particular individuals effectively. All of our workshops, services and most news is posted on this website and our Facebook page. 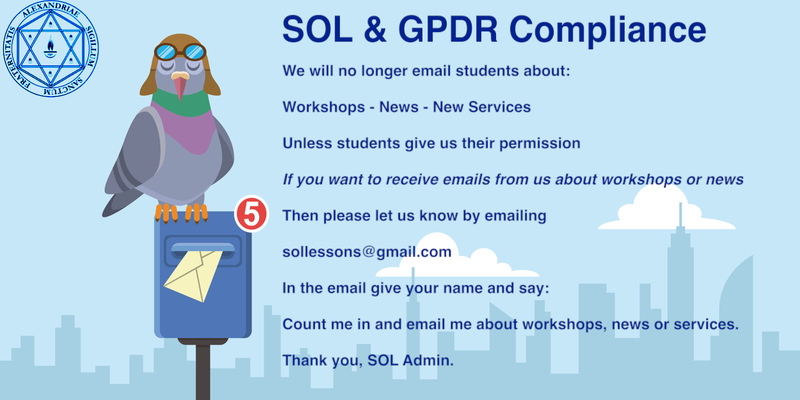 However, we need to update our email database as we now need to ask students that want to receive any emails from us about services or workshops and news to give us their permission to contact them. Please do not email us if you are not a student as we do not have a email database for general marketing. Many Thanks and students, please let us know.